Light was falling through a rosette, illuminating standing characters. Basilica was still far from being completed, but the walls have surpassed everything around by many feets. Construction rose in the middle of a small town, which was to become a place for pilgrimage. Why? There recently happened a miracle. One of the residents made a tea for prince, who was bitten by a bear. And he healed his wounds instantly. News of this came to the court of the regent, and in one month came the order from Vatican. The Pope wants to have a sanctuary with a chapel here, where this man will serve tea to all pilgrims, who travel here. Older hunched man named Jonah agreed. 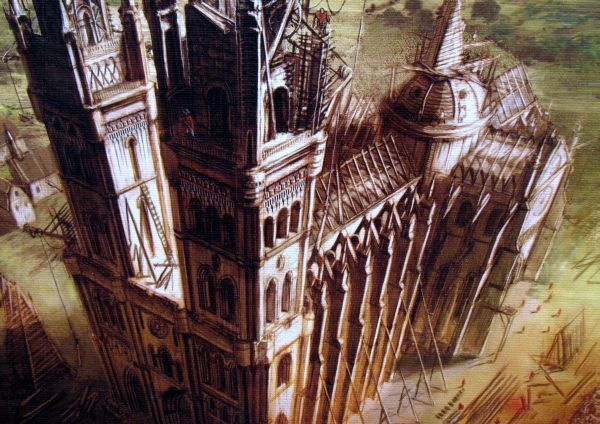 And so work began on a large, with pointed arches decorated building. Ability to add your hand to this work came suddenly to you, the player. 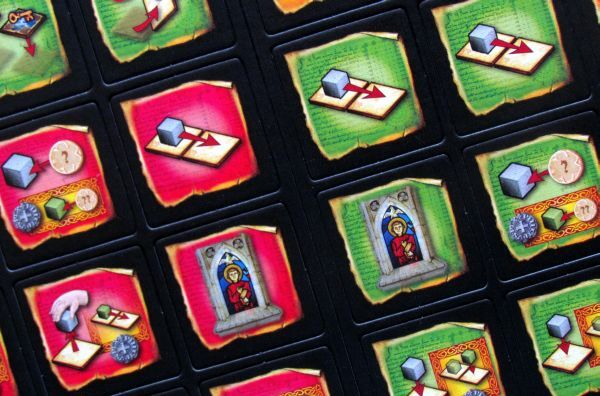 This gives you the chance to play a board game Basilica from REBEL.pl. Its author is Lukasz M. Pogoda and it was published already in 2010. Its not well known, although it came out together with already reviewed and outstanding Tycoon City (review). 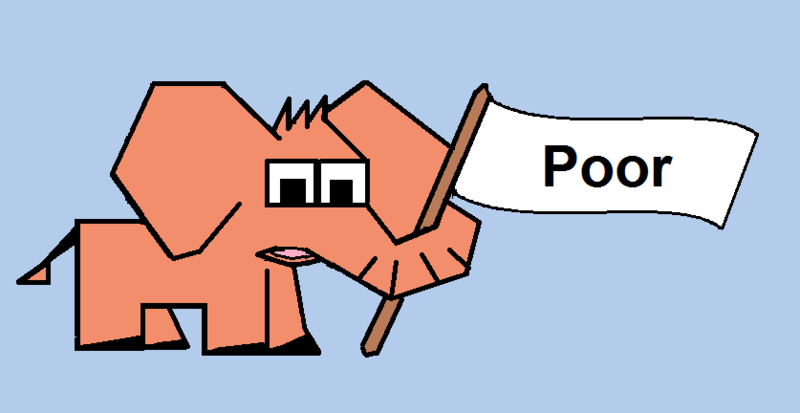 You discover the game without any problems not only in Polish, but also in English. Graphics were made by the author himself, Lukasz M. Pogoda, and also Michal Oracz. Topic of such majestic building is not here for the first time, although this time, we will look even further into history. You may have seen the series Pillars of the Earth or read the original books by Ken Follet. It was foundation for outstanding worker-placement game Pillars of the Earth, released several years ago. And then there is of course Fresco (review in Czech), where you are rebuilding a cathedral. And now Basilica tells a story about another religious building. 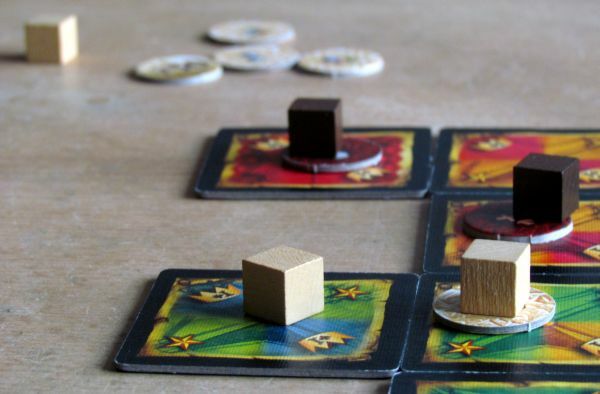 We now look at box similar in height, like the one from the famous Carcassonne (review in Czech). Whilst it has quite sweeping portrait on it, with a portrait of an unfinished basilica, but once you open it, you will find, that most of the space is just air. The box is made according to Fantasy Flight Games model – filled with lined paper with a furrow in the middle. And inside fits everything, you’ll find in the box. A letdown? Maybe. The first time you open the package, you will enjoy punching of colored square pieces, that will form the body of title basilica. Majority of them is doublesided – on the reverse side, you get a chessboard of colors in a golden frame. On some cards, there is a crown +1 symbol in corners. The other side is decorated with icons depicting various actions, which are possible. You will use both sides, while playing Basilica. Besides these, there can be found also cardboard pieces of scaffolding, which are same on both sides and are used for blocking during the game. 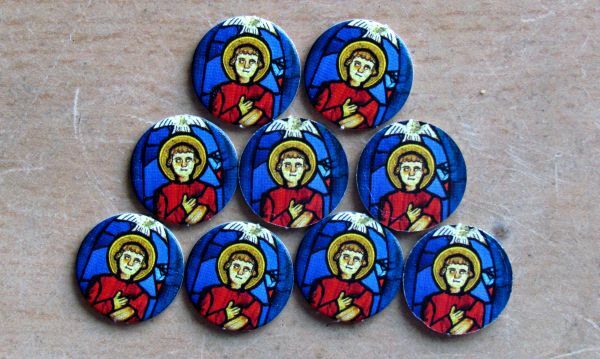 The rest of tokens are round, whether it’s cathedral glass, two coins or tokens with special icons for both players in their colors. One player color is red and the other light brown. 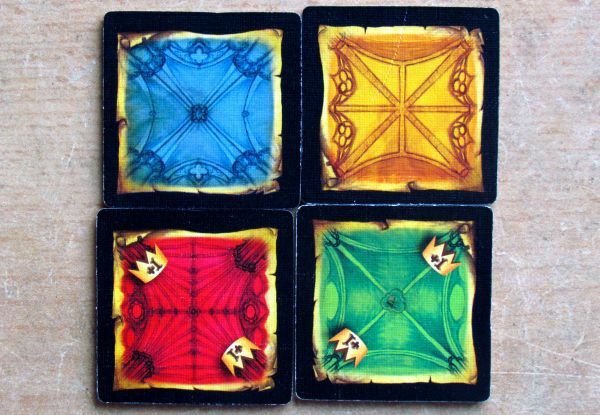 In these colors, there are in addition to these five tokens, also twelve wooden cubes, which are divided equally among opponents. All construction will take place right under the main game board, which is a bit illogical. Instead of constructing the upper side of Basilica, you will build downwards. A little odd choice. Anyways, you willl find six large positions on the board, ordered in two rows of three. Under them is a scoring scale from zero to thirty, with emphasized numbers ten and twenty. 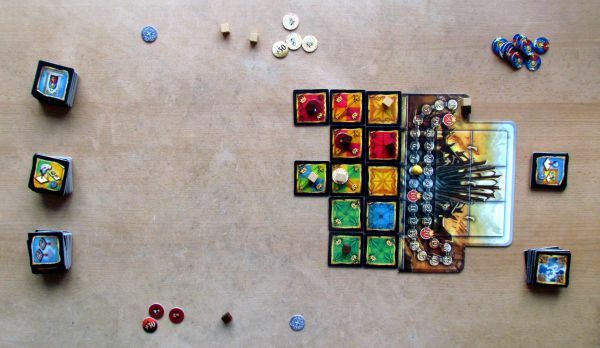 Basilica is just a game for two players, no more, no less. They divide among themselves pieces according to their color. 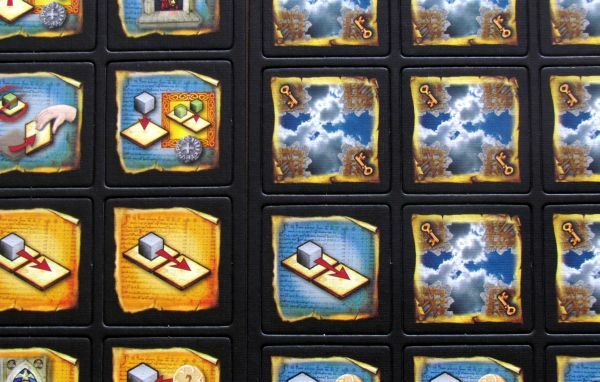 Thus everyone gets some double-sided enhancer tokens, one with a coin, one chip +30 / +60 and his six workers cubes. Main game board should be put on the table on the side, that there is plenty of space beneath its broad side. Each player puts one of his cubes on the scoring scale. There will be also yellow king figurine, who will be traveling with you on the scale. You put aside scaffolding pieces, shuffle all the others and make a column out of them. They should be all rotated with their icons pointing upwards. You then take first six of them and randomly distribute them on the board into six windows. Top row should be rotated with icons up, lower shows only its colored back – icons cannot be used anymore for action. Now you have prepared an offer and indeed the whole game, you can start playing the actual game. 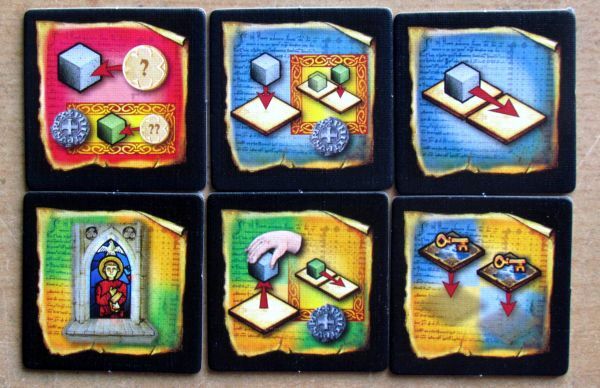 Players alternate in turns and each has three action points, which can be used in any combination of two available actions – you can either take one action tile from the top row and immediately carry out its ability, or you take tile from the bottom of the colored offer and build part of cathedral. Actions can be combined and are both worth one point, so you can do any of them more than once. Basilica is a game of supremacy and majority. 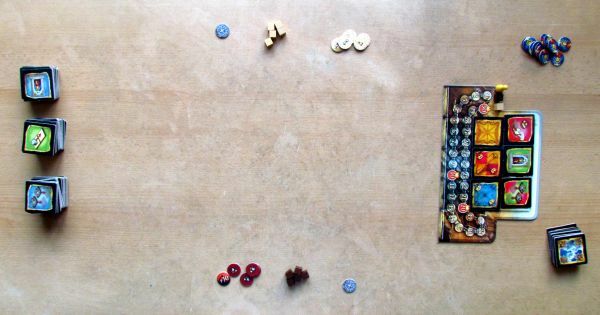 Under the game board, there is place with five columns, where your tiles will be stretching down. 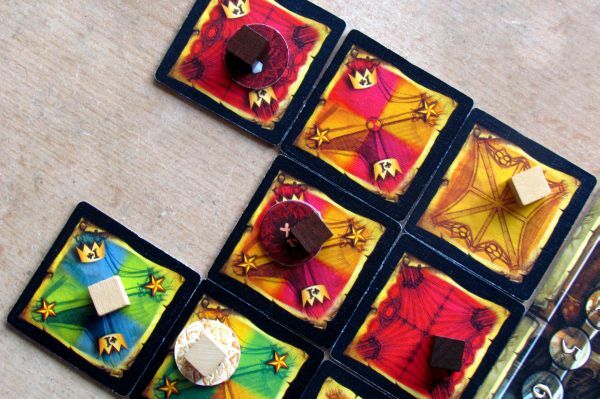 Players try to create colored groups of tiles, which then are worth victory points, when scoring happens. The moment a player adds a new tile to basilica, it him a chance to choose a third action, which we have not mentioned yet. That is placing his worker (cube) on this constructed tile. 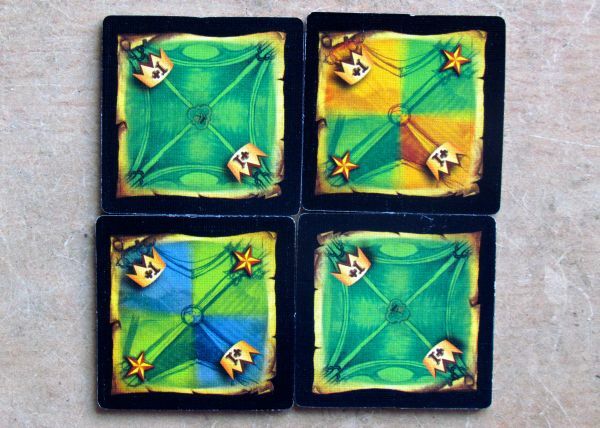 By placing one worker of his color, player tries to gain dominance over this group of tiles (of the same color). And whoever has the most workers in the group, acquires its value in points during scoring phase. Some colored cards also contain an icon with a crown and a plus one symbol. 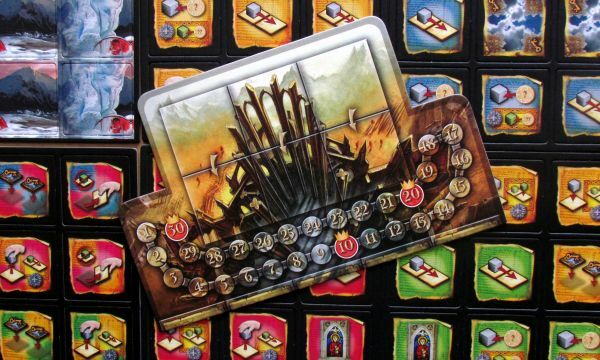 This indicates a simple rule – once this card is added to basilica, you must move the king pawn forward on scoring scale. And the king determines, when scoring occurs and also when the game should end. 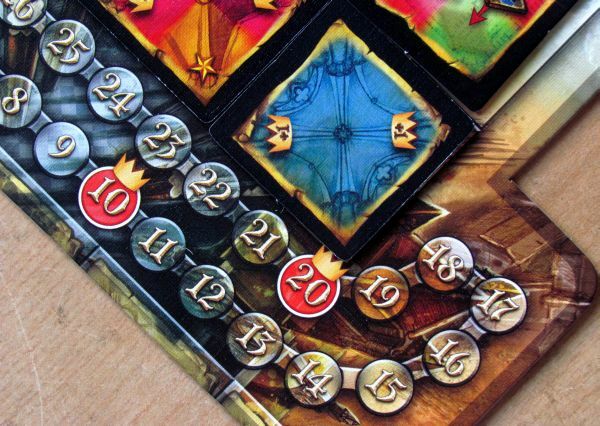 There are three scoring rounds – in a space ten, twenty and thirty and they occur immediately, when the king reaches this point, regardless of part of your turn. It immediately ends and scoring happens. Players add up the number of their workers in each group. Anyone, who controls a group, gets as many points as group contains tiles. 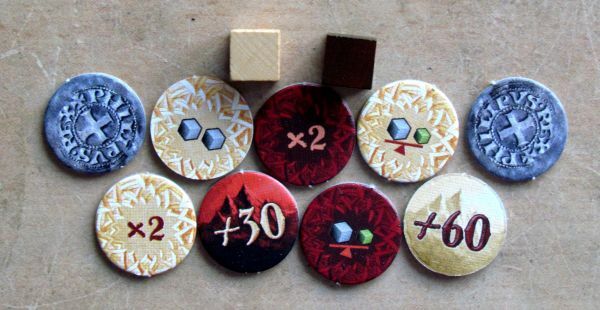 For actions during play, rivals can affect the value of their cubes or group, when they use a bonus token of their color and put it under their worker cube. These tokens can decide ties, make one cubes worth two or double the value of the entire victory points reward. After scoring, of course, all players take their cubes back and continue the game, while discarding some of cathedral tiles. There is another one interesting idea in the game, which makes you see available cards ahead and makes it possible to plan in advance. Each card is starting its journey in the column beside game board, with its action side up. Whenever you buy some action tile from the upper row, you immediately fill it with one of the waiting tiles. If a vacancy occurs in the row below, you do not take new one, but rol over tile from the top row and turn it only with its color side up. Then you fill back also the upper row. You can always see the color pattern in the background, even when an action icon is up, so you know in advance, what colors can be available, when you use tile under it. Once the king stops at thirty, the game is over, and last scoring occurs. Players then determine, whose pawn (cube) came first on the scoring scale below. He is the winner and the main architect of the basilica. 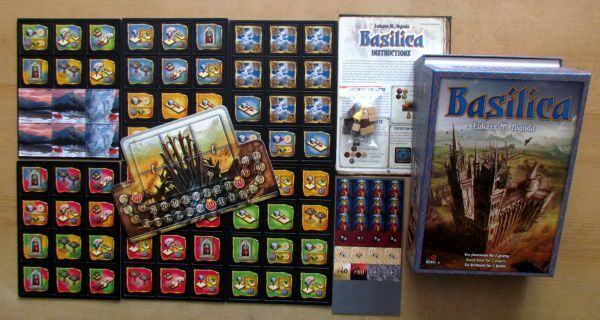 Basilica is a game, which tries to bring something new to tile laying and pattern matching games. Dominance principle can be found even in Carcassonne. But here, you can influence it all with actions or improve your workers. But everything here has been recycled from other games in some form. The combination of the whole remains interesting and rules are easy, but when you play it’s not quite that fun, it should have been. 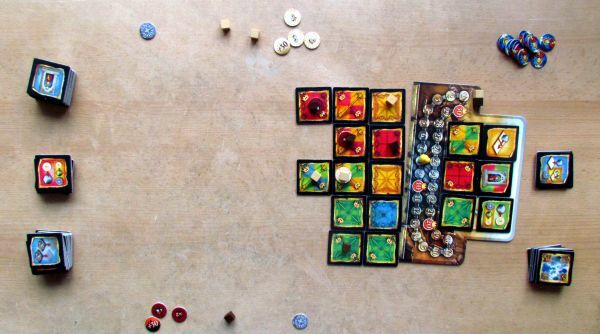 At the beginning, we did not mention the game Carcassonne by accident. It has more in common with Basilica, than meets the eye. Appearance and game options could be deceiving, but in fact it is also about making patterns and prevalence in certain areas. Only scoring happens a lot less, only three times per game. Moreover, there are action tokens and smart offer rotation. 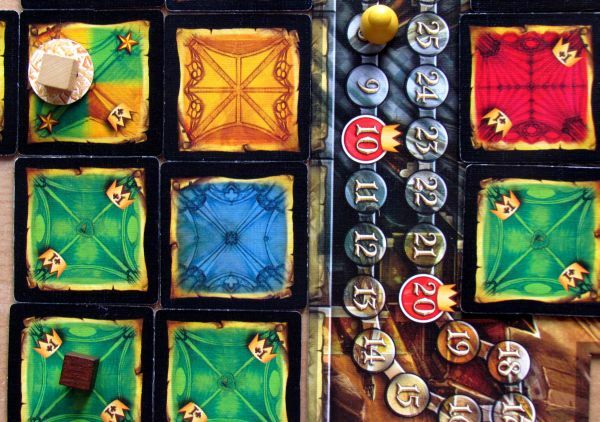 This way, the author managed to avoid the randomness, which accompanies Carcassonne and gave his game a much more strategic feel. But maybe that’s the problem, because the game feels maybe a little too strict. And now we do not talk about visual, but about feelings. Basilica is just a very dry euro and certainly does not feel like you are building something bigger and magnificient. In fact, even the basilica itself retreats in the background and you are simply playing cards to make patterns. No fun in that. And this tile playing is really short for a successful game. Overview of players (especially the younger ones) is complicated by combined cards – containing two colors. If you put your cube on it, you have a big advantage because your worker is counted twice, when scoring – he is part of two groups. 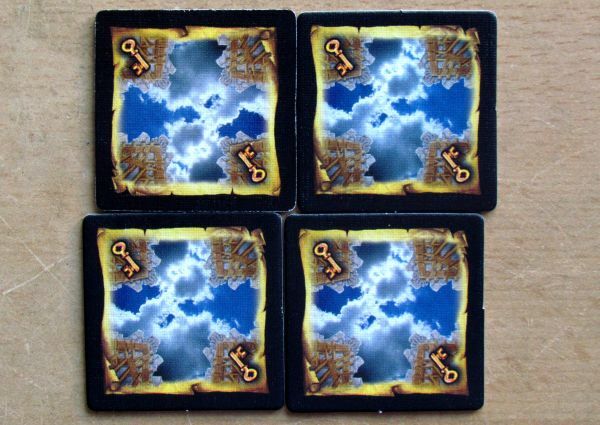 Most of the game therefore revolves around fight for these tiles and the game returns chance, which determines, who of the players actually gets it in the offer, and can take it immediately. We really like the system for timing of game scoring. It is actually determined by the players themselves, and what colors they play. No tile on the menu cannot be avoided, and all will eventually be used to make room for others. 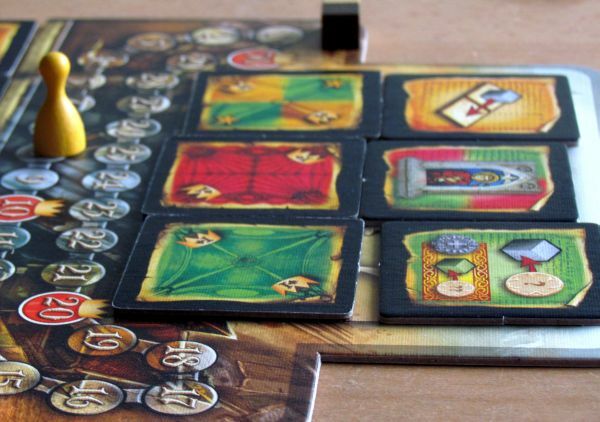 You use a lot of actions during the game, which can not only add, but also remove workers from the board, move them, or harm rivals. 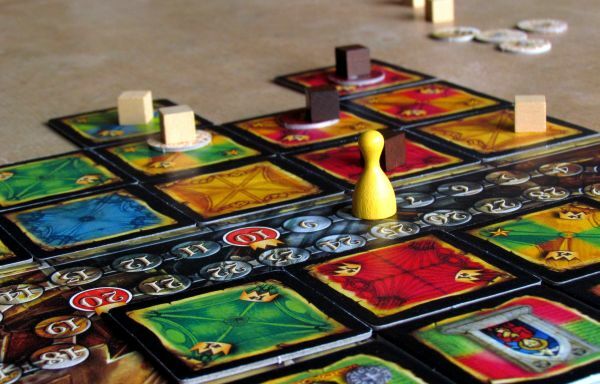 Basilica is a board game, that will surprise you with some nice ideas. But it does not succeed in keep the whole game and an entertaining experience. Its foundations are not strong enough and the game degenerates into a simple laying of tiles and attempt to gain superiority in color. Theme is irrelevant. There is nothing making you enjoy your victory. 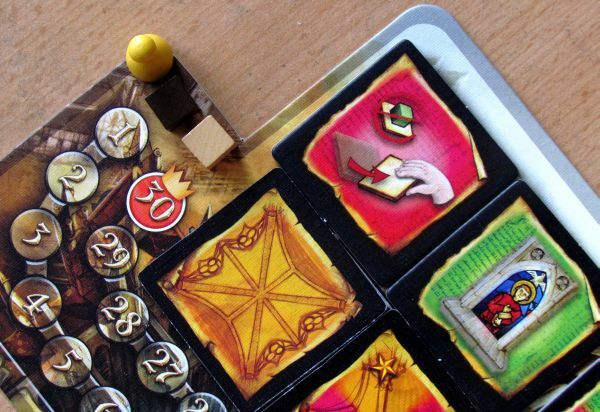 Basilica is not a totally bad game, its quite easy and with interesting elements. 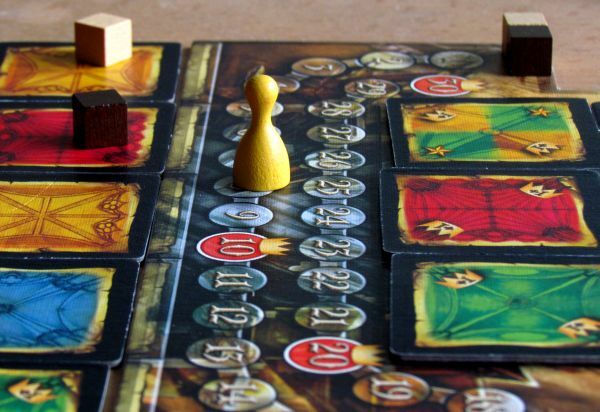 If you like Carcassonne, it could keep you entertained, but its simply missing something. It misses some magic, like a piece of glass, that sheds a lot of different colors. Basilica seems like a nice and thought out game at first. Nothing is suggesting, that it could be the other way around, until you play it. Then you realize, that this game of connecting tiles and gaining dominance on colored stains is lacking atmosphere. There is nothing to keep you entertained and going. Its quite a shame, because Basilica contains several nice ideas. You alone determine, when scoring will happen, by playing the right tiles. And moreover only with turning tile over, you transform an action tile into a colored table usable in building of a basilica. If you still consider getting this game, do not let nice processing fool you and first test it for yourself, if you like the gameplay. 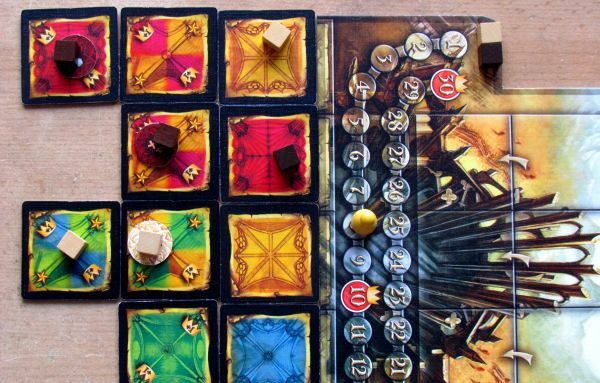 This game can be suitable for some fans of Carcassonne.